A passing stranger Shane (Alan Ladd, This Gun for Hire) befriends rancher Joe Starrett (Van Heflin, Airport) and his family. Joe offers Shane a job at the ranch, which the wanderer accepts. In the meantime, the Starretts and his neighbors are being harassed by Rufus Ryker (Emile Meyer, Paths of Glory), a powerful cattleman who wants to force the settlers out of their lands. Tensions build up to an inevitably showdown. 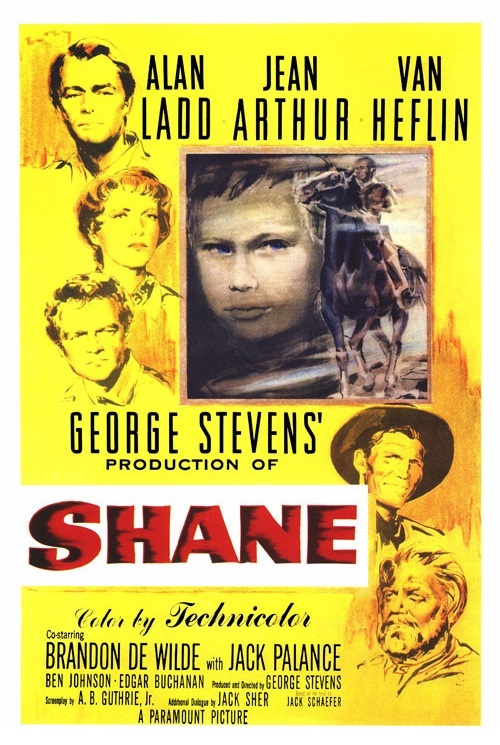 George Stevens’s Shane is one of the sacred cows of the American cinema. Much has been said about the film’s contributions to the American cultural iconography. I feel, however, the movie’s most enduring bequest, which tends to go unnoticed, is its primarily visual language based on a binary system. The result shows that it is possible to create a harmonious marriage between homage and revisionism. Director Stevens (Giant) builds an imaginary bridge that connects the pre-1950s idealized view of the wild frontier with the revisionist attitude that emerged in the post-war era, and continues to strive in recent years. 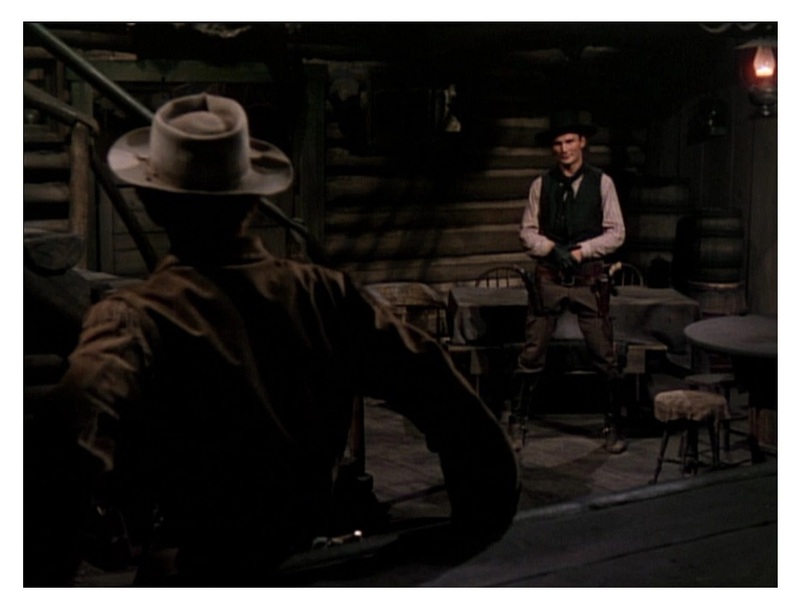 For viewers who enjoy the canonization of the western hero and his habitat, Shane is full of striking images that nearly enter the realm of self-conscious artificiality (courtesy of Loyal Griggs’s, The Greatest Story Ever Told, extraordinary, Oscar-winning color cinematography). But if you do not buy into the myths of the wild west, Stevens allows the ugliness of the frontier life to come to the surface. The interaction between the unattractive and the fine-looking, between the real and unreal, creates contrasts that are very stimulating, and illuminating. Shane also plays a game of paradoxical dilemmas. The good guys resort to violence in order to bring order and peace to the civilized world, an irony that the film explores in great depth. The screenplay by A.B. Guthrie Jr., adapted from Jack Schaefer’s novel, makes a conscious decision of staying away from resolving issues; the opportunity is used to raise questions, not to provide solutions, regarding the relation between violence and justice. 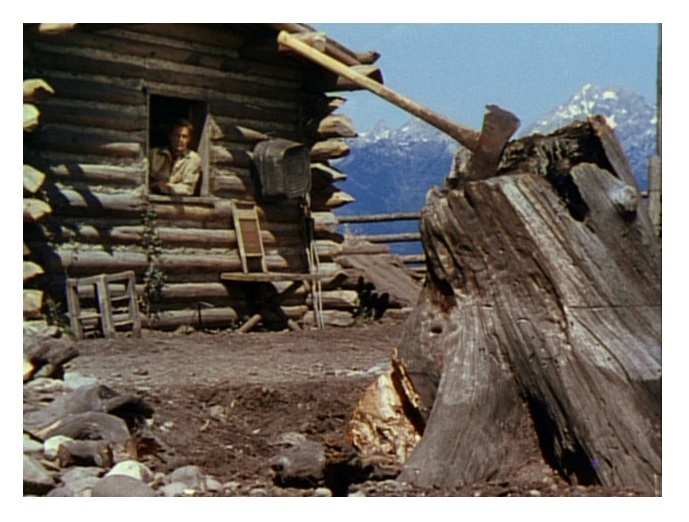 There is also the relationship between Shane and the Starretts’ little boy (Brandon De Wilde, The Member of the Wedding) — this is perhaps the most interesting aspect of the movie because one represents the past, the other symbolizes the future. Alan Ladd is quite good in the title role — it’s probably his best performance. Van Heflin is excellent too. And who does not love heavy Jack Palance? 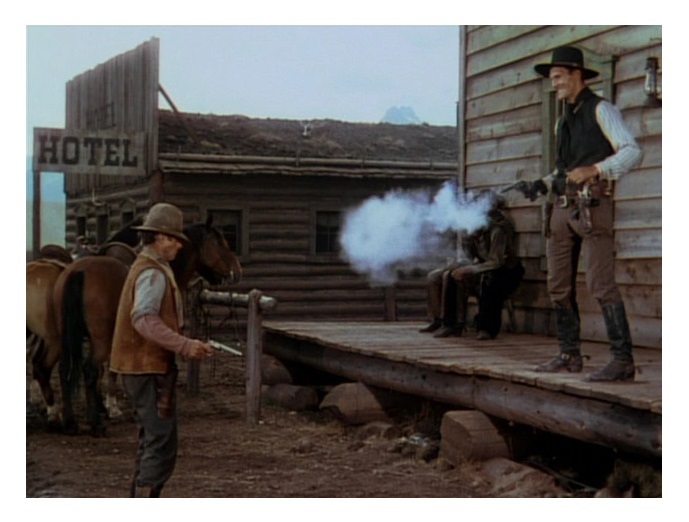 (billed as Walter Jack Palance) — I loved how the dog walked away every time Palance entered the barroom. Jean Arthur, who plays Heflin’s wife, is the weakest link here — she is miscasted as Heflin’s wife (her squeaky voice is better suited for comedy). Ben Johnson (The Last Picture Show), Elisha Cook Jr. (The Maltese Falcon), and Ellen Corby (I Remember Mama) round-up the excellent cast. The leafy music score is by Victor Young (For Whom the Bell Tolls and Around the World in 80 Days). Shane ranks high in the western canon. Later adapted as a TV series, with David Carradine as Shane. Color, 118 minutes, Not Rated.